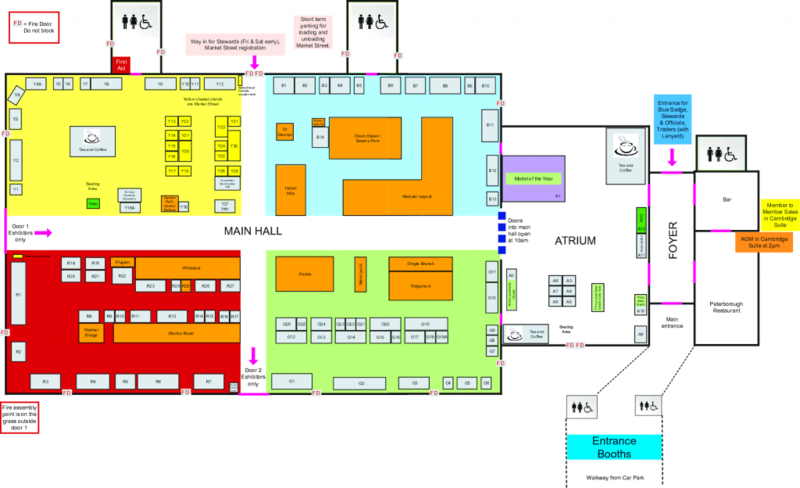 You will note the Main Hall diagram is divided into four coloured areas; this has been done to enable you to find traders/exhibitors more easily. On the list of traders, the trader’s stand number is denoted by a capital letter and then a number i.e. R17 for example. R = Red, G = Green, Y = Yellow and B = Blue. So any trader with a stand number starting with the letter G, will be in the Green area of the Hall. Those with a letter A in front of the number are located in the Atrium. Yellow shaded stands are Market Street. Click on the floor plan to zoom in. Please note that it will not be possible to renew your membership at the show. Whilst every effort has been made to ensure the accuracy of the information contained in this web site, we cannot guarantee its absolute accuracy. We reserve the right to make changes to the information without giving prior notice. All details were correct at time of posting, but there may have been alterations after posting which do not appear on this plan.